For upscale accommodations, modern amenities and first-class service, choose Crowne Plaza Times Square Manhattan. Our iconic New York hotel is ideally located directly on Broadway between 48th and 49th streets and is surrounded by Broadway theaters and Manhattans best restaurants, shopping and nightlife. Famous attractions such as Radio City Music Hall, Rockefeller Center, Central Park, Carnegie Hall and the Museum of Modern Art are only steps from our front door. Our newly renovated hotel offers 795 oversized guest rooms with sleek decor, spectacular panoramic views and high-end amenities including 46-inch flat-screen televisions, in-room safe, MP3 players and more. Additional onsite amenities include Brasserie 1605 Restaurant and Broadway 49 Bar (both overlooking Times Square), a business center, a full-service Concierge Desk and a 29,000-square-foot New York Sports Club. For meetings and events, your group will have everything it needs to succeed. Within close proximity to many Midtown corporations and with 23,000 square feet across 32 function rooms, we offer the best meetings venue of all hotels in New York. Crowne Plaza has the ability to host functions for up to 700 guests, including small to mid-size meetings of any kind. Plus, an onsite certified meetings director will help you every step of the way. 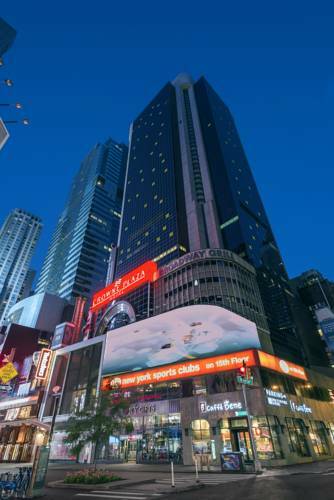 Conveniently located in Midtown in the center of Times Square excitement, Crowne Plaza New York is the perfect choice for both business and leisure guests. Home of the World Famous Singing Waiters. Enjoy some of the best diner food in the city with singing waiters entertainment, good fun for all. Only a few steps away from the hotel, this restaurant specializes in Southern Italy cuisine. Small breakout room or boardroom overlooking Broadway. Small breakout room or boardroom. Interior location. Boardroom overlooking Broadway and Times Square. Large breakout room that partitions with 402 to accommodate up to 95 people for theater style seating. Large breakout rooms that partitions to 401 allowing theater style up to 95. Our main ballroom encompasses 6780 square feet with 4 partitions, named Acts 1 through 4. High ceilings, 2 stages, and no pillars allow for an unobstructed view for up to 700 theater style. Our lobby level ballroom encompasses 4,182 contiguous square feet with 3 partitioned rooms, entiled "Times Square A", "B", and "C", and opens up into an additional 2057 square foot bi-level banquet room overlooking 49th Street: our Balcony Room. Children's program - Central Park is located 10 blocks north of the hotel and boasts many playgrounds and a zoo. The Intrepid Sea Air Space Museum and The Museum of Natural History are great choices. Many of the nanny services can offer day trips to the city's attractions. Amtrak, New Jersey Railroad, and Long Island Railroad all stop at Penn Station. At over 800 acres, it is the world's 2nd largest city park, and home to the Central Park Zoo, several hiking and jogging paths, Rumsey Playfield, Wolman Skating Rink, the Jacqueline Kennedy Onassis Reservoir, and more. The Late Show With Stephen Colbert is filmed live at the legendary Ed Sullivan Theater just a few blocks up Broadway, which previously was home to The Late Show with David Letterman. Home to the Juliard School, the New York Philharmonic Symphony Orchestra, and over 1 dozen more organizations of the music and arts. The world's most famous arena, MSG is home to the Knicks and Rangers, and hosts dozens of concerts and other large events. The Crossroads of the World, Times Square's bright lights are visible from many of the rooms in the hotel, from its restaurant, and from the front door on Broadway. The financial capital of the United States and home to the New York Stock Exchange. The worldwide headquarters of the United Nations is located along the East River in the Turtle Bay section of Manhattan, just east of the hotel. Guided tours are available. The Visitor Centre is located on 1st Avenue at 42nd Street.